It now seems like just a matter of time before humans are living on the Moon. NASA, China’s CNSA, Russia’s Roscomos, and various private companies are all planning lunar colonization missions. Less certain is what a Moon base should look like — but a team comprising members from universities and research institutes across Europe has a worthwhile suggestion. As a part of the European Space Agency’s Spaceship EAC initiative, students and graduates studying a range of disciplines, from aerospace engineering to biology, worked together on a Moon base design that recently earned them the runner-up distinction during an international competition. Architecture student Angelus Chrysovalantis Alfatzis from Greece’s National Technical University of Athens described his team’s design in an ESA blog post. “Our idea is to transport inflatable modules to the base of a small crater on the South Polar Region of the Moon, and then gradually fill the cavity with lunar soil, until the modules are effectively buried,” he told the ESA. 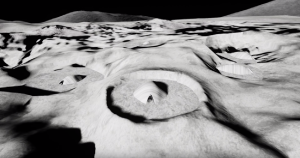 A video that served as part of the team’s submission for the competition provides additional details on their proposed Moon base, bringing to life their futuristic vision for lunar colonization. Editor’s Note 2/7 at 9:45 AM ET: This article has been updated to clarify that the team members hail from universities and research institutes from across Europe.